Receptra Naturals Review (Updated 2019) | Plus Coupon. Does it Work? CBD product companies are popping up like weeds. Thusly, our company reviews are absolutely uncompromising and with only the readers’ wants and needs in mind. If reputability and transparency are essential when purchasing CBD products, Receptra Naturals lands on the shortlist. Receptra Naturals takes pride in their organic, family-farmed, Colorado grown hemp which possesses their carefully honed proprietary genetics. Because of their bold decision to exclusively use the flower of the hemp plant for their concoctions, this brand seeks to change the game. Catered towards a hard-working, sporty lifestyle, this brand offers two lines of hemp oil products: one developed for the ‘Active Lifestyle’ and one to support general ‘Health & Wellness’. The Active Lifestyle line is geared more towards those who are seeking mental and physical enhancement especially for high performance, while the Health and Wellness line is more subtle, it could support the body as a lite version of the Active Lifestyle line. 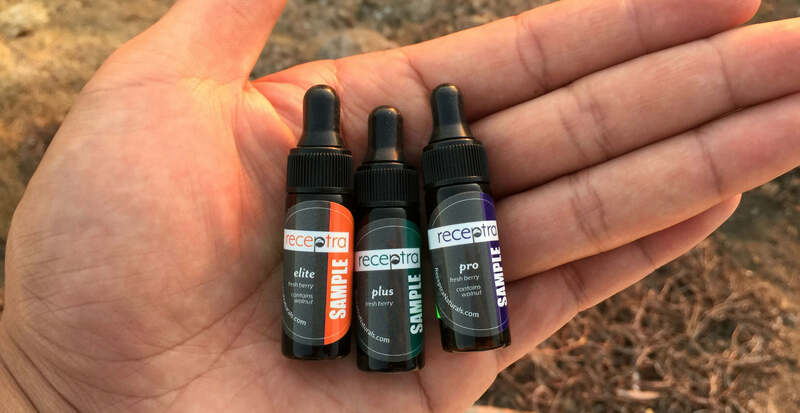 Offering quality CBD products ranging from $25-$250, Receptra Naturals actually walk the talk by using a third party laboratory to test their products and post the results online. To view, check out their website where you can identify the specific batch of your product – this is not something we’ve seen before. All other pertinent information is at easy reach, be it about potency percentages, possible mold/contaminants, and even the levels of heavy metal present, etc. So, we head out and test the two lines for ourselves. We tried three Receptra CBD oil products which includes two from the Active Lifestyle line (Pro fresh berry, 75 mL; Elite fresh berry, 300 mL) and one from Health & Wellness line – Prime fresh berry. See these items on receptranaturals.com. Noticeably, the Elite and Pro fresh berry, from the Active Lifestyle line, have a stronger, muskier scent. The berry flavors smell more like a fresh or mint small than berry. However, they did a good job covering up that unusual CBD oil smell – that unnamable musk that’s so unique to CBD oils. On the other hand, the Prime fresh berry, from the Health and Wellness line, smells the same but maybe a bit stronger, since the only other oils are sunflower oil and MCT oil (the Elite fresh berry has even more oils). These products taste about the same but with minor distinctions in strength. Receptra Naturals is a unique-tasting CBD oil. Since these products are darker in color due to retaining more chlorophyll during extraction, they’ll make an even stronger impression on your taste buds. The fresh berry flavors do more for the scent than the taste. All this we found perfectly manageable, especially when we followed this with water or juice. If you are a ‘CBD purist’, meaning you don’t like too many carrier oils in your CBD oils, maybe this brand is not for you. There are just too many additional oils! People might think this is unhealthy. Especially, if you’re not a big fan of vegetable oils, we implore you to check the product ingredients labels first. If you value honesty and potency results more than the actual taste of the products, then Receptra Naturals can deliver the goods. A few rare CBD oils out there taste delicious but this is not one of them. You can try other flavors like avocado oil, grape seed oil, and turmeric to see if they taste better. All in all, Receptra Naturals is definitely worth trying because of the high quality ingredients, their unique high performance line, their variety of products and a wide range of prices. Shop at receptranaturals.com and get 15% discount on CBD & Hemp products.